SERIOUS Investing: What happened to YFG? I blame it on myself to even consider it as this stock is highly risky. Firstly, if you look at the below which was last year's annual report I thought that it is a cheap company with its new management having a view to make things right. The front page of the Annual Report says, "Engineering Change". Two years before that, it did change most of its management, major shareholders and the way they do business. The past management and owner were parties that are connected to a political party. Hence, in usual cases contracts were signed through that means but with poor management. With the takeover, I was thinking that it could have changed fast. It definitely has proven that is not easy to turnaround a company even with the change in management, change in name and changing the way business is done. In fact, they were so adamant to change that they changed to a Big 4 auditor (may not be a good thing). 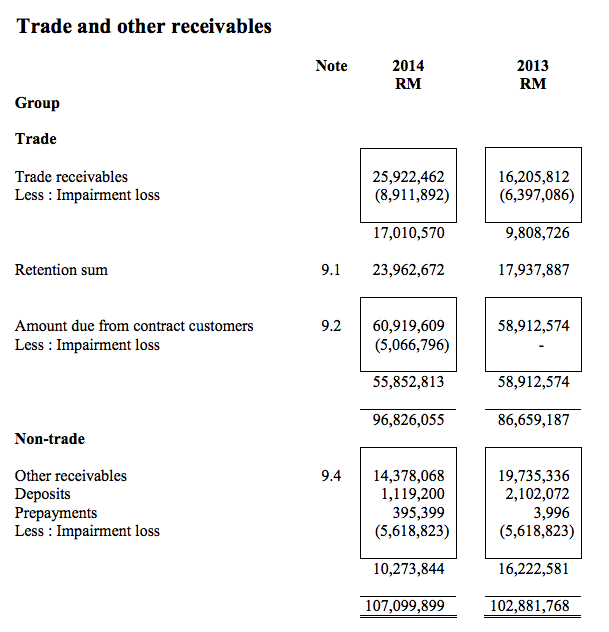 How many sub-RM100 million companies in Bursa has a Big 4 auditor? With this, I thought since YFG is in a space where there are opportunities, it would have a good chance for growth. But the company's past probably still haunts the company. If you look at the accounts, its biggest challenge is the amount due from contract customers. I am not so sure whether these were issues that were brought from the old management. If this is, then their due diligence were not done proper. They were probably too keen to rescue the company from collapsing. Just look below. I am pretty sure that YFG cannot afford the hit totalling that amount of RM20.908 million, as if it does the company will go under PN17. Usually, if it potentially is a bad debt, many parties may opt to take the hit slowly - I think this could be the case for YFG. As YFG has substantial projects in hand, I would think that they would be able to absorb the impact especially where they have stronger major shareholders now. But it will take a longer time to recovery. And not as fast as I would have envision. - write off whatever that is doubtful. There is no point dragging over these issues as its business continuity is at stake. And I think the reason for the health reasons for the CFO to retire is a bit coincidental judging from the amount mistakes on this case i.e. underestimating the amount to write off from one of the projects which ran into a change in management, non-ability to address the qualifying statement by KPMG early and the poor cashflow management as well as having to suspend the stock trading due to the company's quantum of impairment. They just did a private placement announcement. Not asking money from shareholders as they know they can't do it. The Star reported that YFG's Sabah contract has been terminated.